The cloud forests of South America are home to some of Earth's most extraordinary creatures, but few are as intriguing as the glassfrog. Seen from above, most glassfrog species look pretty nondescript, but a glimpse of their underbelly reveals a fascinating anatomical anomaly: translucent abdominal skin. From underneath, a glassfrog's heart, liver, and various other internal organs are often completely visible. Why would an animal evolve such a trait? We spoke with an expert to find out. Understanding the anatomy of a glassfrog requires a broad understanding of its ecological role. How and where does this creature live? What are its behavioral quirks? What makes this variety of frog (known formally as Centrolenidae, the family encompasses roughly 150 known species) so unique that it would evolve a physical trait like transparency? To find out, we spoke with evolutionary biologist Juan Manuel Guayasamin, who studies glassfrogs extensively as a researcher at Universidad Tecnológica Indoamérica's Center for Research on Biodiversity and Climate Change. "Glassfrogs are fascinating for several reasons," explained Guayasamin in an interview with io9. "They combine a morphology and behaviors that are seldom seen in amphibians." Parental care, for instance, is provided exclusively by males. "Females flee as soon as they have delivered the eggs. Then males stay during weeks in close proximity of the egg clutch, improving its survival probability by maintaining it wet and, sometimes, scaring away predators." The tendency for male frogs to protect their young from predators bespeaks another trait unique to glassfrogs: the males can be extremely aggressive. "It is a funny scene looking at two tiny frogs fighting for hours," explains Guayasamin. "The fights usually include... grappling and dangling, with their feet firmly attached to the leaves above. Males hit each other with bony spines that they have on their arms and that can produce severe injures. Fights end when one of the frogs (the loser) falls." Of course, a glassfrog's most noteworthy physical feature is its clear abdomen. The extent of this transparency can vary from species to species, but some glassfrogs are completely clear, revealing all of their internal anatomy. "It is really a beautiful and unusual thing to be able to see a beating heart," Guayasamin says. "My work is try to understand the origin and evolution of all the aforementioned traits. This task combines natural history observations and an evolutionary framework, meaning that we first need to understand how the 150 species of this family are related, and then trace how behavior and morphology have evolved in this tree." Complete transparency has evolved multiple independent times. This suggests that a translucent underbelly provides some evolutionary advantage. "Most frogs are not transparent because this would expose organs to the deleterious effects of sunlight and heat," explains Guayasamin. But in transparent glassfrogs, key organs like the liver and digestive tract are covered by a thin layer of light-reflecting organelles called iridiphores. 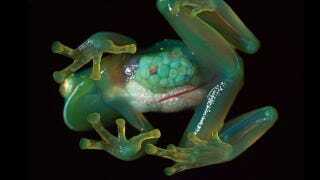 These iridescent cellular subunits may provide a layer of protection from heat and sunlight, a feature that Guayasamin says could give glassfrogs the ability to optimize their internal homeostasis by simply moving about, "covering each organ at a time, as opposed to the entire body cavity." Guayasamin says another hypothesis holds that transparency evolved to help glassfrogs avoid predators (an ability commonly referred to as "crypsis"). "Most glassfrogs are green and reflect light almost as a leaf. For predators (and amphibiologists), it is quite difficult to find a glassfrog if it is not, for example, calling." Ideally, we would find two closely related species, one with a completely transparent abdomen and iridophores around key organs, and the other with an opaque abdomen and organs not covered by iridophores. Then, we would need to measure if the organs are equally efficient or not. For crypsis, we could manipulate the transparency of some frogs and determine if that affects its cypsis in relation to the leaves. We would need to measure the reflectance of transparents glassfrogs, non-transparent glassfrogs and compare them to leaves´reflectance. Read more about Guayasamin's research in this extensive review of glassfrog taxonomy, and at UTI's Center for Research on Biodiversity and Climate Change [In Spanish].